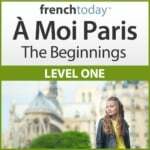 I hear many mistakes when students translate “I am taking a French class” in French. They tend to translate word by word from English, and unfortunately, it doesn’t work. I’ll give you many options to translate “French class” in French. In French you cannot say “French class”. Your class is not French itself: it’s a class about the French language. “French class” is an idiom in English. So translating word by word and saying: “une classe française” is a mistake. When you say ‘I’m taking a French class’, what you are really saying is that you are taking a class about the French language. ‘I take a French class = I take a class of French language’ = je suis une classe DE FRANÇAIS. On a side note, people have been pointing out that it should be “je suis un cours de français”, the class being the people, the course the content. It may be a mistake, but it’s very common in French to say “une classe de français” for both people and content. More about how to translate French and France in French. The name of the language is “le français”, and it’s masculine. “La langue” being feminine, the adjective “française” is also in the feminine.